Lucks Casino invites all British gamblers to benefit from this awesome promotion. Make a deposit of at least 10 Pounds using the code CASH and you will qualify to get a 25% cashback bonus up to £300. 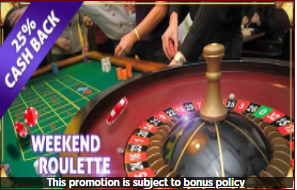 If you play Roulette games during the weekend and lost, there’s no need to be upset. Benefit from this bonus and keep the fun alive. Remember to wager the bonus amount 50 times before any cash-outs. Take advantage of this deal right away!